If you are selling your home soon, you would be well advised to pay attention to home buying market trends and what consumers want/don’t want in their homes. There is a wealth of information to absorb if you know where to look. Read on if you want to hone your home buying market trend knowledge. Mark Nash, a seasoned real estate broker/author has surveyed 923 real estate agents, managing brokers and association executives and put together a great article citing What’s In, What’s Out With Homebuyers. In case you’re not familiar with Mark Nash, he’s a real estate author, broker and syndicated columnist based in Chicago. The author of several books, including 1001 Tips For Buying And Selling A Home. He contributes residential real estate analysis to Bloomberg TV, Business Week, CBS The Early Show, CNN, HGTV.com, Smart Money Magazine, The New York Times, The Today Show and USA Today. He also hosts the 1001 Real Estate Tips website. Mark’s list of what’s in and what’s out is summarized below. There were a couple of home buying market trends listed as ‘what’s out’ that I made note of. One of them being spiral staircases, once considered to be a positive component of a home is now considered to be a negative for aging baby boomers. Pets and young children have a tough time navigating them, as well and kids don’t like them. In other words, they are an accident waiting to happen. I poured through the above mentioned article by Mark Nash, and the next day I made a visit to a new home under construction near my house. What do you think I found inside? A spiral staircase with wooden treads (steps) and a kitchen maxed out in glass upper cabinet doors. I am fairly certain that this is a custom build with a contract on the house because the kitchen was painted in, what I considered to be, a non-complimentary color of blue-green. 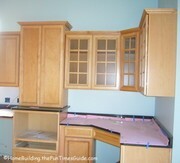 Sandy says the cool color clashes with the warm tone of all of the cabinetry. I’d have to say I agree. View the pictures and decide for yourself. Real Estate: Who’s Buying Now?